John Baillie, an army veteran is supporting Erskine with a 620-mile challenge this spring. 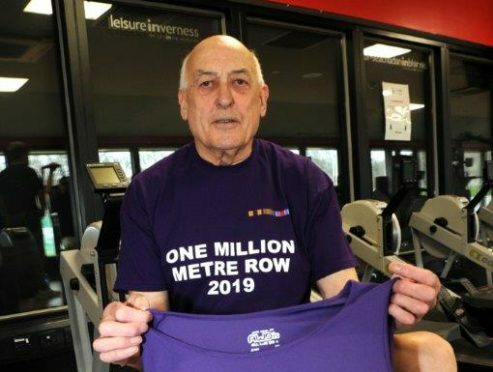 John Baillie, a former staff sergeant with 2/51 Highlands Volunteer, will row one million metres – or 620 miles – for veterans’ charity Erskine. But there’s no need for him to worry about the volatile Highland weather or turning tides, as he’ll be clocking up the miles on his trusty rowing machine. After returning to civvy street, Mr Baillie worked in security and delivery for Tesco, and he has combined his vast experience as a veteran, shop worker and fundraiser to raise money and awareness for Erskine. Mr Baillie said: “I hope that locals and visitors to the area will see what I’m doing as unique and exciting. “The fact I’m rowing more than 620 miles and I am 77 on my next birthday will hopefully mean they’ll chuck a few quid into my collection bucket. “I’ll be rowing in local supermarkets around the Highlands and in my local gym in the next few months without moving an inch. “Having served in the army, I’m well aware of the difficult experiences so many service men and women go through. “Erskine do a wonderful job caring for veterans and their families and so I felt taking on this challenge is the least I could do for them, whilst also keeping myself fit. Mr Baillie also plans to row in other places of interest around the Highlands including Fort George, where he volunteers at The Highlanders Museum, and the Victorian Market in Inverness. Erskine’s community fundraiser for the north, Michael Parkes said: “It’s an honour that John is supporting Erskine with this incredible challenge. “John speaks very passionately about his time in the army and his various charity work over the years. Mr Baillie will be collecting funds at his first public rowing sessions at Elgin Tesco Extra on Friday and in his home town at Inverness Eastfield Tesco on Sunday from 10am. Support can be given online at www.justgiving.com/fundraising/john-baillie4.